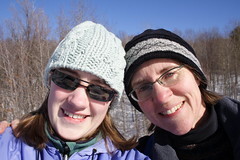 This entry was posted in outdoor recreation, winter. Bookmark the permalink. It looks as if y’all had a great time. If I ever tried skiing, I’d probably never be able to walk again. We went x-countrying too today! A beautiful day here as well. Glad you had such fun with your daughter! So…did you tangle up in a tree, too? The mom with the camera wields the photos, after all. Our WNY snow has been heavenly. Best skiing in years! Enjoy! I too love cross country skiing. It looks like your pup was having a blast that day. I just discovered your site and you seem to have similar passions: outdoors, photography and crafts. (those are the things I’ve read on your site so far). 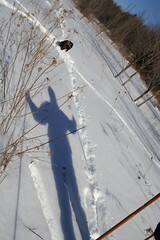 I have yet to be out XC Skiing this year! Looks like so much fun and I wonder if a helmet is needed for XC Skiing?